This solid hardwood full size High Loft Bed is rock solid thanks to the unique, patent pending Rock Lock mechanism. Solid steel bolts compress the 2 beds' legs onto each other to ensure a rock solid connection. An added cross beam provides extra stability. 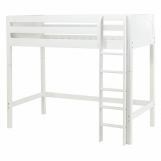 Included are extra high guardrails to create a safe sleeping environment. The added straight ladder has extra deep and grooved steps that make getting in and out of bed safe and easy. You can add a full length desk or student desk and schoolhouse chair to create a great study environment, or add storage units like dressers or bookcases that use every inch of space under the Loft.